We have all been there, someone starts following you on Twitter and all of a sudden, they are either harassing you or tweeting things you don’t want to see. In this day and age of social media it is nice to know you can take some steps to deal with unwanted followers (creepers, trolls or just weirdos). With many of my clients I have noticed they know how to use Twitter but only to Tweet or change something in their profile. The rest is what I’m there for and this issue is one I have to deal with more often than I want. 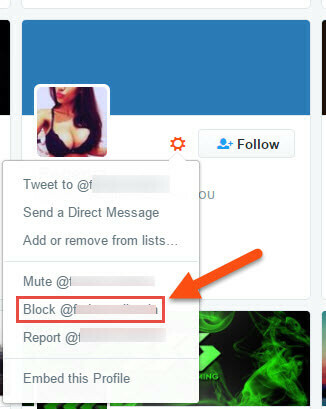 If someone is bothering you on Twitter, you can block, report or even mute that follower. In this article I will show you how to block them. Step 1: Log in to your Twitter account. 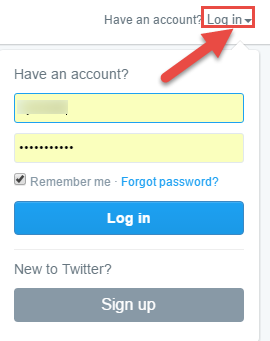 Just head here (twitter.com) and up on the right, click the Log in button. Step 2: Once logged in, you will arrive on your home page. From here, you will want to go to the left of your screen under your header photo. 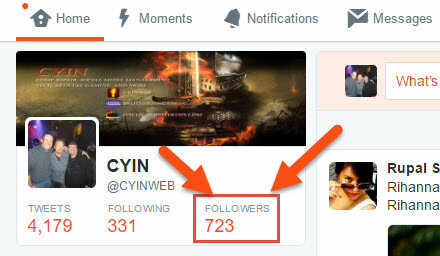 Here you will see the word, “Followers”. Click it. Step 3: This will bring up all your Twitter followers. Now you will need to scroll down to the one you wish to block. I will be choosing this one because I know it is a spam/dummy account. Right under their banner image you will see a sprocket (Meet George Jetson… his boy Elroy… Love that cartoon). Click on it. Step 4: Now you will see a drop down menu with many options from Blocking to Sending them a direct message or Mute @name. You will want to select “Block @name.” If they are a more aggressive follower, you can choose the option “Report” from the list to report them to Twitter. Step 5: You will now see a confirmation window. From here all you will need to click the Block button. You have officially blocked this follower and you will no longer see their posts, messages or anything else from them. There is a second way to get the same result. That is, after signing in to Twitter, head to the Followers profile page and look at the right side under their header image. Here you will see that same sprocket from the above steps. Just click it and you can block them from there. Ever have an issue with Twitter followers? Share below. I became the target of a large group of right-wing trolls this election season and because of the horrific crap they were flooding across my twitter feed, I chose first to MUTE each of them and then BLOCK them. That way, the crap they were flooding my feed with disappeared first (mute) and then the block prevented them from posting any more. Thanks for sharing this with us Vickie Rock. 🙂 Great tip on Muting them first before blocking . Social media is great but there is always someone out there wanting to cause trouble. i find if others share their experience it could help someone else out in some way.